Jaguar Land Rover (JLR) has confirmed it is cutting 4,500 jobs, with the substantial majority coming from its 40,000 strong UK workforce. Most of the cuts will be in office roles as the company wants to simplify its management structure. It adds to last year's announcement of 1,500 job cuts. JLR, the UK's biggest vehicle maker, is planning a voluntary redundancy programme to help manage its latest round of departures. "We are taking decisive action to help deliver long-term growth, in the face of multiple geopolitical and regulatory disruptions as well as technology challenges facing the automotive industry," said JLR's chief executive, Ralf Speth. "This will safeguard our future and enable vital ongoing investment into autonomous, connected, electric and shared technologies." JLR says it will be making further investment in electrification, with electric drive units to be produced at Wolverhampton and a new battery assembly centre to be established at Hams Hall, Birmingham. They are also concerned that the company is permanently reducing its UK production capacity in the face of what could prove to be short-term headwinds. The company has made some of the most urgent warnings among UK manufacturers about the damage that Brexit uncertainty was doing to investment in the UK. 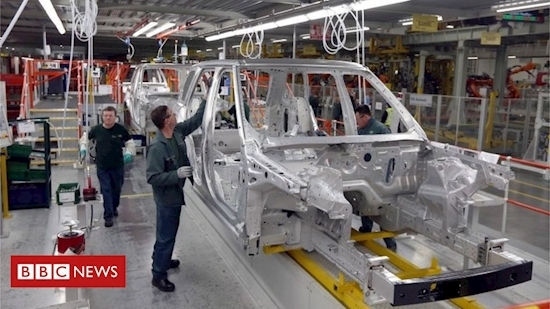 Jaguar Land Rover has been saying for more than a year that Brexit uncertainty would eventually take its toll on the perception of the UK as a stable and competitive base for global manufacturing. Another massive flashing red light is a collapse in sales in its biggest market - China. And JLR is also one of the most heavily exposed car makers to continuing consumer confusion about the wisdom of buying a diesel car in the aftermath of the VW emissions scandal. Ninety percent of its vehicles are diesel-powered, although it has been investing in new electric and hybrid vehicles. The layoffs come amid what industry insiders have called a "perfect storm". That includes a slowdown in Chinese sales, a slump in diesel sales and concerns about UK competitiveness post-Brexit. China is the company's biggest and hitherto most profitable market. But sales there have fallen nearly 50% in recent months as cautious Chinese consumers have been holding back on big ticket purchases amid global trade tensions. Are you a Jaguar Land Rover employee? Will you be affected by the job cuts? Email . Jaguar has been increasing headcount elsewhere in the world. In China it has hired 4,000 workers since 2014. JLR's Castle Bromwich factory makes the Jaguar XF, XF and F-type models, while the Solihull facility produces the Jaguar F-Pace, Land Rover Discovery and Range Rover models. The company's Ryton and Halewood facilities manufacture the Jaguar XE SV Project 8, Range Rover SV Coupé, Land Rover Discovery Sport and Range Rover Evoque models.